The ADJ Micro Burst, part of the Micro LED Series, is a Moonflower effect that looks like hundreds of pieces of colorful confetti being projected around a room. 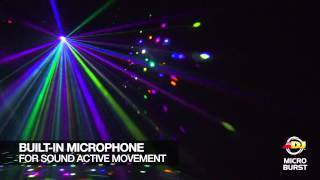 With it’s low power consumption, long life LED source, and it’s ease of use, the Micro Burst is a great effect that brings pure lighting excitement to parties, karaoke events, small bars and clubs, and for home use. Considering purchasing the American DJ Micro Burst ON-THE-GO? Have questions? Ask people who've recently bought one. Do you own the American DJ Micro Burst ON-THE-GO? Why not write a review based on your experience with it. Might be ok in someones house. I really regret buying these...to top it off I bought two of them! The video that helps sell these lights is very misleading! Useless for commercial use, fine for a house party - just about! I would not recommend these to anyone and wish I'd spent my money on something better. You get what you pay for but with this light you get quite a lot. Nice effect and easy to use. Power cord is way too short tho and it needs an adapter to uk. I would buy again but it's just for small stuff, house parties and so on. Perfect lighting for 16th birthday house party - daughter loved it. I was really looking forward to receiving this product as I had a gig coming up, but I think I expected too much from it, the venue i was playing was quite large. It would be ideal for a house party or smaller venue, I have a couple of moonflowers so I had plenty of back up, the lighting effect is good and puts out some random patterns but for the price I would probably save up a little more and get a more powerful piece of kit, it will still be a feature in my set up but for the smaller parties. Canot praise them high enough , EXCELLENT customer service from djKit. 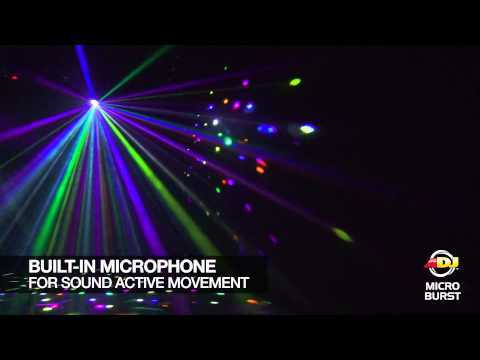 Seen a video for American DJ Micro Burst ON-THE-GO online or have you own video? Check out American DJ Micro Burst ON-THE-GO on DJkit.com!